It’s October 1st, which means spooky season is finally upon us! Our two little boys have been talking about their halloween costumes for MONTHS. With the new movie “Lego Ninjago” that recently came out in theaters, ninja’s have quickly turned into our oldest’s favorite thing. Our youngest has been all about that Minions and Trolls. When I was growing up, we always celebrated halloween by picking out our own costumes and trick-or-treating the neighborhood with all of our nieces and nephews. By the end of the night, we were happy to have the jackets on that we protested wearing an hour before (it’s pretty chilly around the fall time) and our parent’s got stuck holding all of our swords, helmets, masks, wings, crowns or any other miscellaneous toys we got sick of wearing/holding. With Halloween always being a big deal in my household growing up, I wanted to create a fun, yet gory, pattern this season that would satisfy other Halloween fanatics as well. 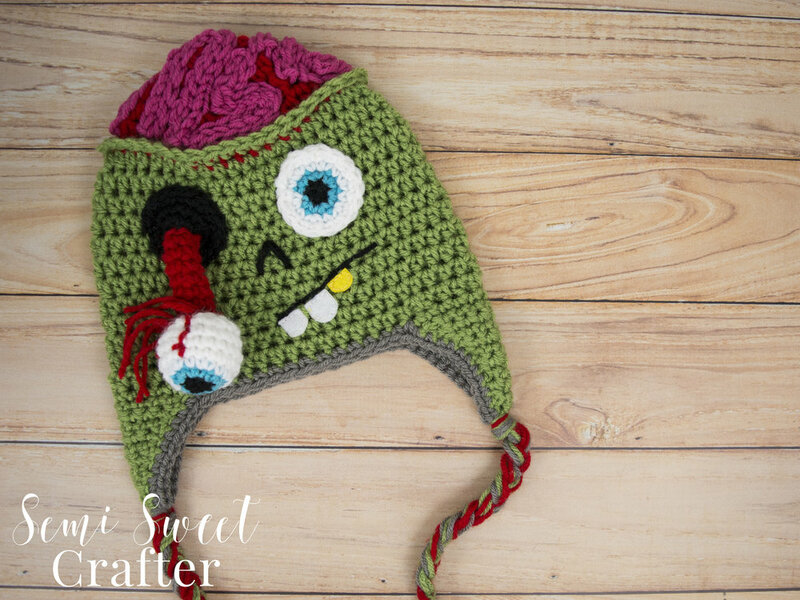 So, join me for the zombie outbreak with this fun new FREE crochet hat pattern. Sl st into next st, tie off. 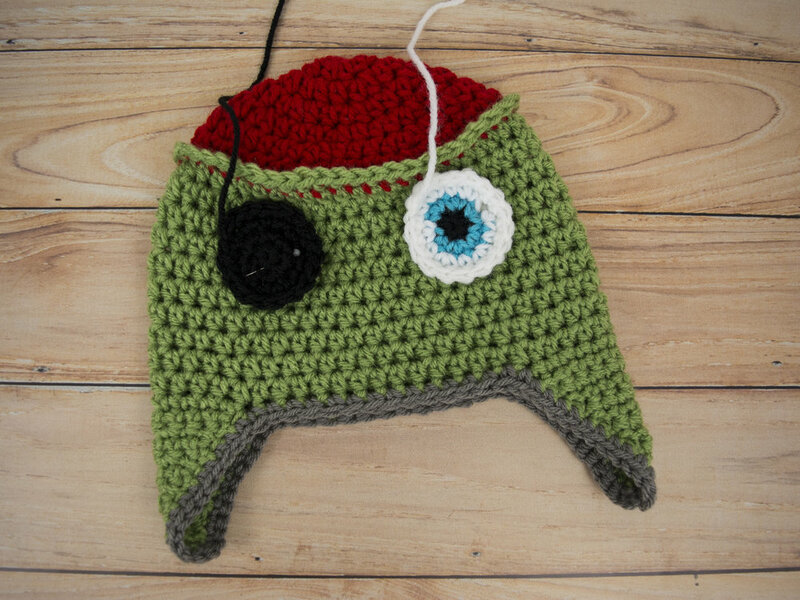 Switch to green yarn. Tie off. Switch to grey yarn. Sc evenly, all the way around the hat. Using green yarn, sc in the front loop that was skipped on the green base of the hat (see pattern pointers). Fasten off leaving a tail to sew onto the hat. Sl st into next st, tie off. Switch to white yarn. Stuff quite stiffly to help keep round shape. Sl st into next st, tie off. Switch to red yarn. Fasten off leaving a tail to sew onto Black Eye. Using red yarn or red thread, st on veins (see pattern pointers). Using a strand of black yarn folded in half, sew an upside down "V" for the nose (see pattern pointers). Using a strand of black yarn folded in half, sew a slanted line for the mouth (see pattern pointers). Using felt sheets for the teeth, cute out shapes and sew them onto the hat using thread (see pattern pointers). 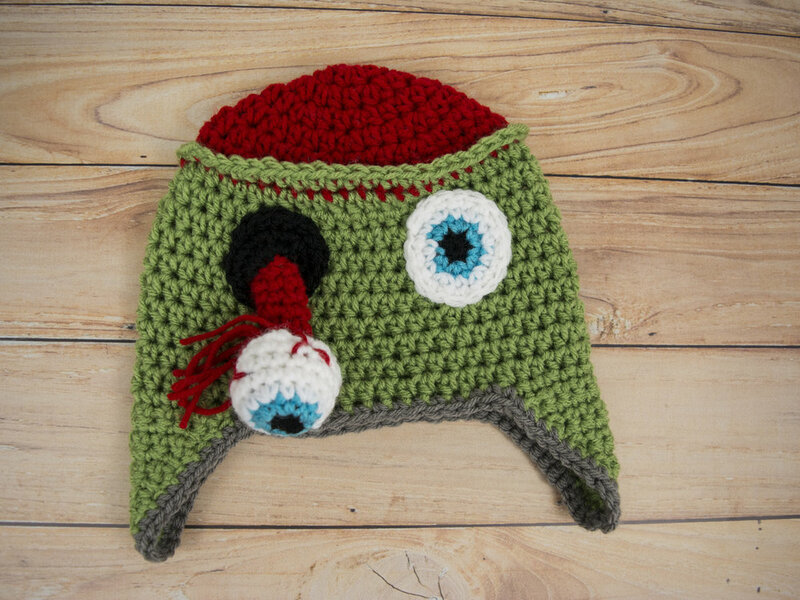 Using grey, green and red yarn. Cut 18 strands of yarn 28" each (6 of each color), separate 9 strands for EACH earflap. Attach to bottom of earflap and braid (see pattern pointers). Using the slip stitch method, make a series of slip stitch rows in sets of three (see pattern pointers). In the first round of the base that was made in green, the stitches are done in the back loop only. Now working in the front loop only, sc in each st around. The total st count will vary depending on what size of hat is being made. One eye will be all black and the other eye will be black, blue and white. 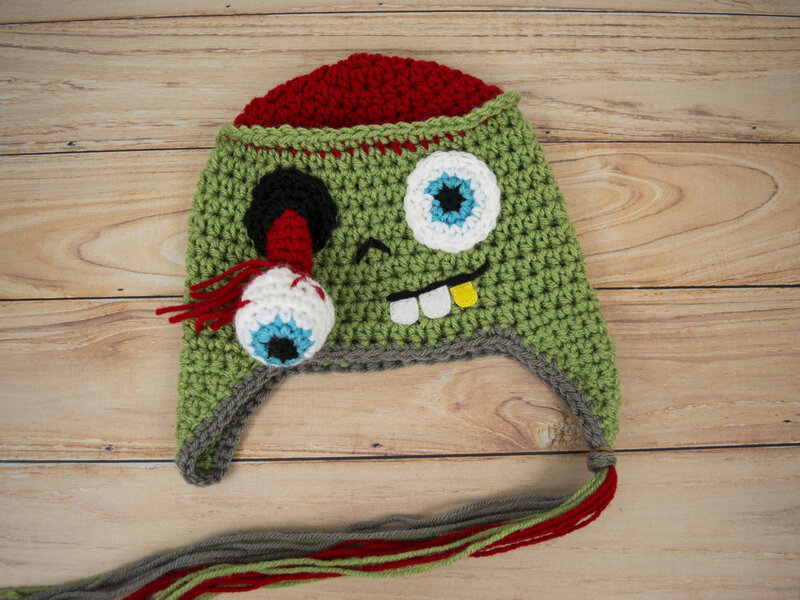 Sew the eyes on the green part of the hat but make sure that there's enough room for the nose and mouth on the bottom half of the hat. 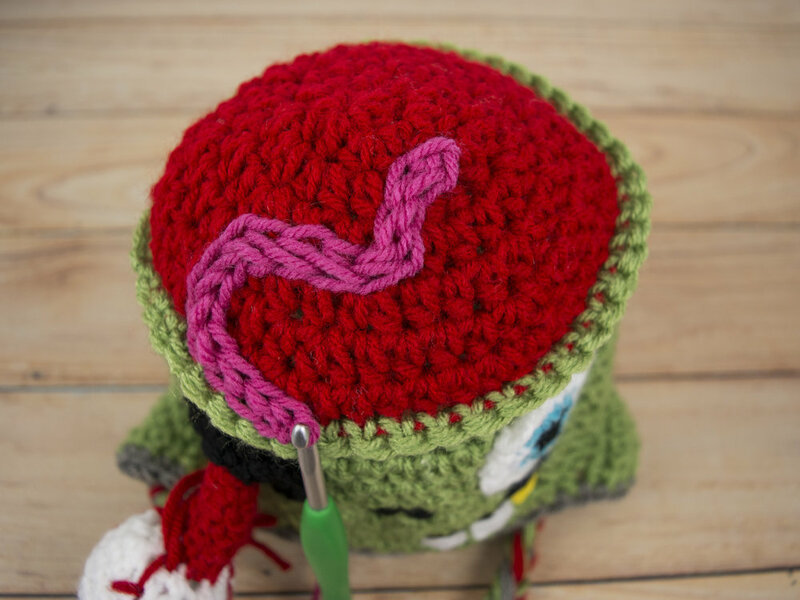 Using a strand of red yarn folded in half, sew a vein onto the eyeball that looks similar to a long "Y". Repeat making more veins until you get the desired look you want to achieve. Optional: Instead of weaving in ends from the veins you can knot the strands and let them hang out for an added "gore" texture. The stuffed eyeball will be sewn onto the black eye. Using a strand of black yarn folded in half, sew an upside down "V" for the nose. Using a strand of black yarn folded in half, sew a slanted line for the mouth. I like to line it up with the region between the middle of the nose and the middle of the eye. The teeth can be made in a wide variety of ways. For this pattern I cut some shapes out of felt sheets and sewed them on with thread. 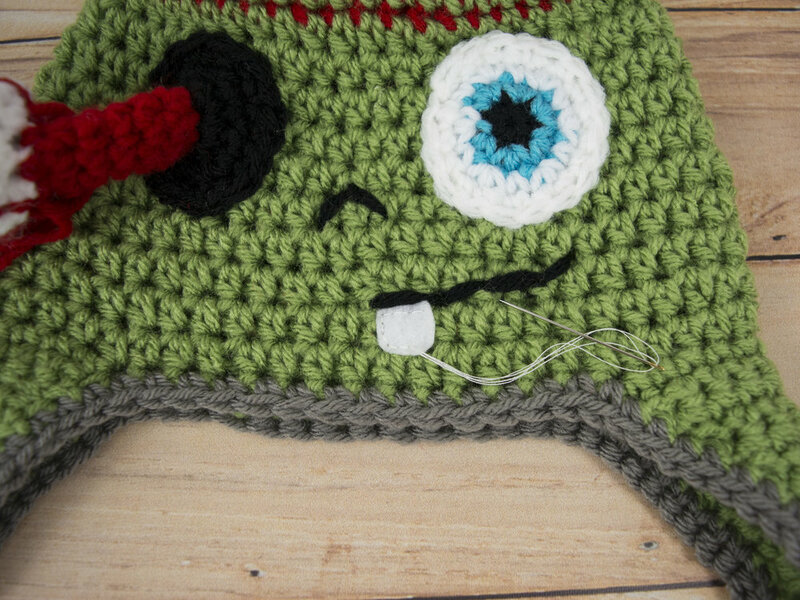 If you don't have any felt sheets you could crochet some teeth or even weave some white/yellow strands of yarn between the stitches to create the look of the teeth. Its all completely up to the crafter. Fold 9 strands in half (three of each color), loop and attach to bottom of earflap. Splitting the strands into three equal parts, braid. Repeat for the other side. The brain is made in a series of slip stitches rows. Starting with your beginning loop on the inside of the hat, insert your hook and draw up the loop, insert your hook into the next space and pull up another loop with your working strand. 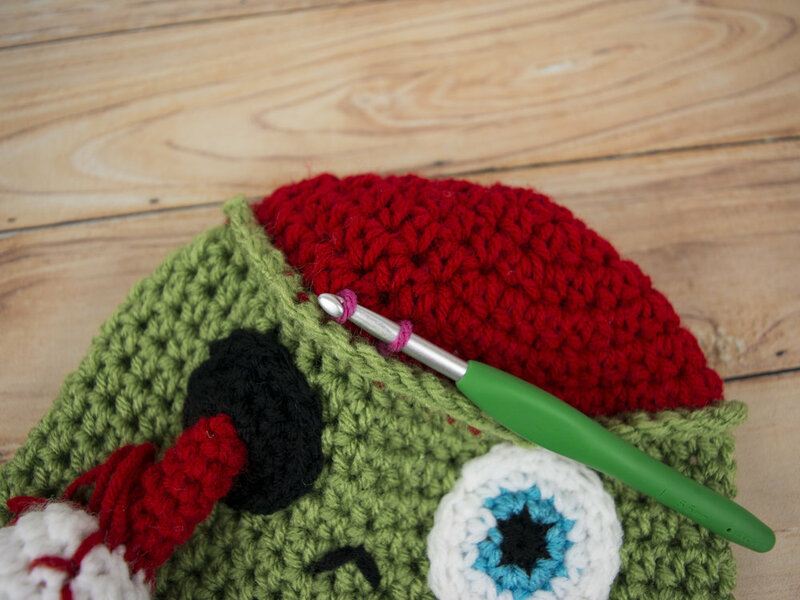 Pull that loop through the first loop on your hook and that completes your first slip stitch. 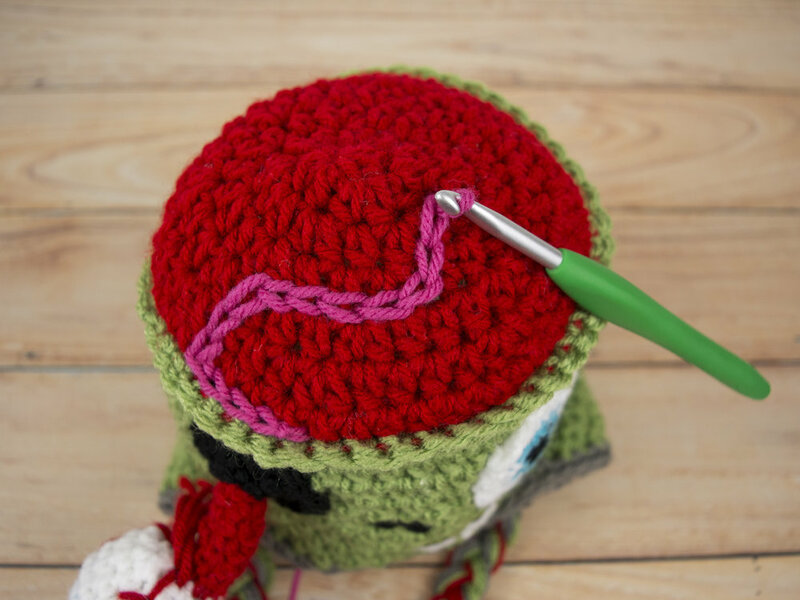 Continue making slip stitches by pulling up a loop and pulling it through the first loop on your hook. I like to do three rows of slip stitches together so the brain has some thickness and texture.